Join our clubs annual tradition of placing shamrocks on the grave of William Blanchfield and honoring both Blanchfield and Samuel Garrans. Descendants of Mr. Blachfield along with a Piper and members of SADOE, NSSC, and SAMS are generally in attendance. Open to members and non-members to honor our fallen Veterans. 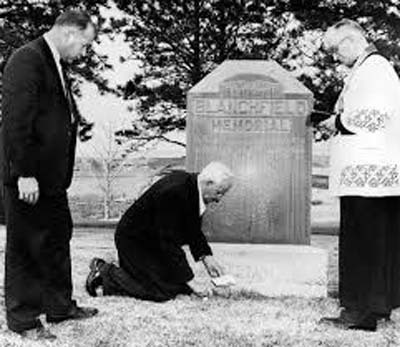 The tradition of placing the shamrock at Blanchfield’s grave dates back to 1925, carried out at first by a grieving mother in Ireland and a conscientious undertaker in Reno. After serving in the Great War, William Blanchfield immigrated to the U.S. and applied for citizenship. 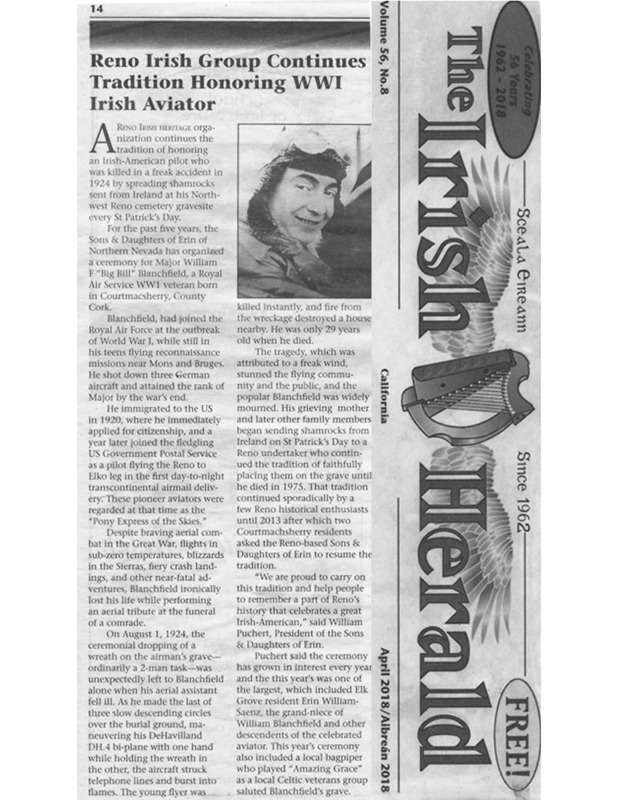 He landed a job with the fledgling U.S. Air Mail service and was assigned to the Reno-Elko run. To say Blanchfield was a local hero in 1924 might be an understatement. Reno’s children knew him as “Big Bill,” and followed him about town whenever he was on the ground. Blanchfield was famous for his friendly manner and fearless attitude. He was as skilled a pilot as there was, which made his death all the more shocking. On the afternoon on Aug. 1, 1924, in Reno, and a group of mourners were gathered at the Knights of Pythias Cemetery off Nevada Street for the funeral of Air Mail Service mechanic Samuel J. Garrans, who had died in an accident three days earlier. Flying above the mourners, in his DeHaviland DH-4 biplane, was 29-year-old “Big Bill” Blanchfield. It was his idea to pay tribute to his fallen friend by circling the cemetery three times and then dropping a wreath on the grave. He had circled the cemetery twice when something went terribly wrong. Blanchfield’s plane went into a flat spin, ripped through telephone and electrical wires and crashed into the side of the McKinley home at 901 Ralston St. The force of the impact ruptured the gas tank on the plane, setting it and the house ablaze. Blanchfield died instantly. His funeral was at St. Thomas Aquinas Cathedral, and he was laid to rest at the veterans’ plot at Mountain View Cemetery. The Reno Air Mail Field, now the site of Washoe County Golf Course, was renamed Blanchfield Air Field, or Blanchfield, in his honor. The following spring, a package arrived in the mail of Reno undertaker Silas Ross. It was a sprig of shamrock, sent by Blanchfield’s mother with a letter requesting that it be placed on her son’s grave on St. Patrick’s Day. With the exception of one year during World War II, when Blanchfield’s mother died, the shamrock arrived each spring. Blanchfield’s sister in Ireland picked up the tradition after their mother’s death. 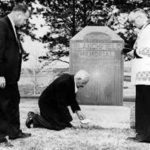 Ross dutifully placed the shamrock at Blanchfield’s grave in Mountain View Cemetery until his own death in 1975. The tradition faded after that, but not entirely. In 1982, Barbara McKinley Rabenstine quietly rekindled the tradition and continued it for more than 20 years. Local historian Cindy Ainsworth joined Rabenstine in 1997. In 2014, the Sons and Daughters of Erin picked up the tradition and rekindled the public tribute. 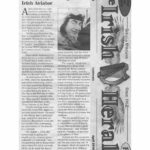 They worked with several people in Ireland, including Dinny Healy, a former Reno resident who retired to Ireland, in getting the shamrock shipped from Ireland for the ceremony.